Some recent reviews for The Octopuppy. 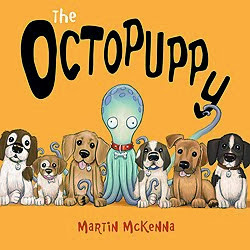 Edgar is eager for a puppy, but when he gets a yellow box deceptively decorated with dog bones, he’s disgruntled to discover there’s not a canine in the package but a goggle-eyed, eight-legged cephalopod named Jarvis. Jarvis’ enthusiasm for Edgar is stunning—he emerges from his box with confetti and ribbons and regales his new owner with masterful tricks, such as wearing all the shoes in the house and holding lots of ice-cream cones at once. Edgar is dead set on a dog, though, and it’s not until Jarvis follows his command to sit that he’s satisfied, and it’s off to the dog show. Can Jarvis obey like the doggie Edgar wants him to be? (Spoiler alert: no.) It takes a while, but Edgar eventually learns to value Jarvis for what he is—a brilliant creature who looks boffo in a tux and is better than any puppy. McKenna’s hilarious illustrations and uproarious page turns capture a fantastic array of cartoonish emotions, from Edgar’s furrowed-brow fury and head-hanging regret to Jarvis’ charmingly oblivious attempts to impress, all of which are obvious enough that young ones who haven’t mastered reading yet will still be able to follow along. Kiddos will chuckle over Jarvis’ antics, and they’ll be heartwarmed when Edgar finally appreciates his octopal. Superb laugh-a-minute absurdity. 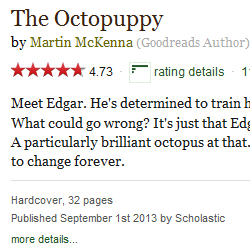 In Martin McKenna’s The Octopuppy, young Edgar dreams of having a dog. However, he is gifted a pet octopus instead! Edgar is not quite willing to give up on his dream and makes every effort to train Jarvis to behave like a dog. Jarvis is very intelligent, and tends to follow commands in his own unique way, much to Edgar’s chagrin. Eventually deciding he is a failure at being a dog, Jarvis runs away. It takes Jarvis’ absence to strike home to Edgar that Jarvis was not a dog, and Edgar should not have been trying to make him behave like one. Edgar begins searching all over for Jarvis, but will Jarvis hear his heartfelt apology? The book is colorful, and has very cute illustrations that children and adults will fall in love with. There is some surprisingly morbid humor tucked inside the images as well that children will likely not notice, but may cause a chuckle from adults. For example, when Jarvis runs away he flushes himself down a toilet – something typically reserved for disposing of waste and the occasional fish funeral – and even leaves behind a farewell note. There is also a scene during Edgar’s search for Jarvis where he holds up a missing poster to a butcher standing in front of a pile of fish.